Back in 2017 one of my favorite pitches from the Frontieres coproduction market was for Jan van Gorkum's horror comedy The Cleaner. Writer/director Jan Van Gorkum also said during his pitch that wants to do most of the effects in shot, which is of course music to any genre nuts’ ears. So. Having won over his favor, van Gorkum has decided to treat us with an exclusive look at a piece of conceptual art. I want to say that we have all been there but then I would be caught lying for a sixth time. It does however, give creative meaning to the water cooler boast, 'they were a beast in bed'. 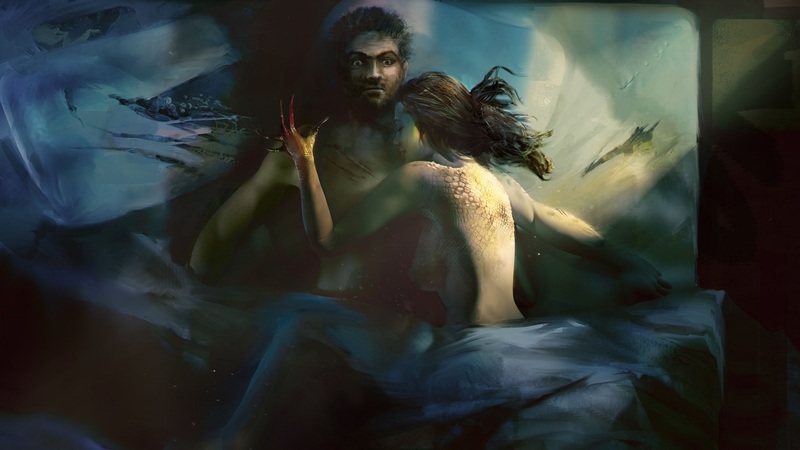 The concept art shows the film’s unlikely hero Barry in the claws of his beautiful but not quite human love interest Olivia. The Cleaner centers around Barry, a down on his luck construction worker, who gets caught up in a bloody power struggle between demons in human disguise, and discovers his true purpose in life: cleaning up their mess. Back in 2017, The Cleaner was pitched at Fantasia’s Frontières International Co-Production Market, where the project generated a lot of interest. Since then, the team behind the film has been hard at work on developing the film. Producer Jan Doense (House of Netherhorror) is currently attending Berlin’s European Film Market to close a financing deal for the film. The Cleaner is the feature film debut of Dutch writer/director Jan van Gorkum, who made several award-winning short films.